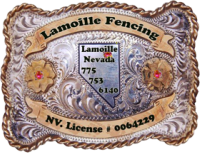 Lamoille Fencing is a small business located at the base of the Ruby Mountains in Lamoille, NV. We provide services locally to the Elko, NV area, all of Elko county, neighboring counties which include Eureka, Lander, and Humboldt. We have traveled to western Nevada to build fence and we are always happy to look at a job that is within our scope of work. We currently have 3 crews building fence, 2 part time office assistants and Dean and Cindy. We are extremely proud of our staff as they are the backbone of our company. Many of the men on our fence crews have been with Lamoille Fencing for many years. We have very little turnover so there is not a lot of time spent training new men. This allows us to mobilize to a job and to quickly and efficiently get it done. We have been in the fencing business since the year 2000. Dean was able to work for a few years in the Sacramento area sub- contracting for Blue Lake Housing Authority. This provided an excellent opportunity to expand our experience to construct many various types of fence. We build residential and commercial fences. We have built chain link, vinyl, pole/rail fencing with wire, and ornamental fence. We have also built wildlife fence and range fence for the various gold mines in our area and also for some of the local ranchers located in our area. We have built fence according to Nevada Department of Transportation specs and the Bureau of Land Management. We have grown considerably in the last 5 years and we are excited about the future. We would like to expand our services to include putting together fence materials in a kit form for the homeowner or business owner that would like build their own fence. We would provide the customer with all the necessary material they would need to build their fence, saving them valuable time chasing down material that they might not have thought about. We continually provide quality service and construct fences that are professional looking and will last a long time. Lamoille Fencing is a small business located at the base of the Ruby Mountains in Lamoille, NV. We specialize in building traditional and custom residential and commercial fencing.